It has been a long while since I did a full blog post. I have a habit of looking back and counting my blessings each year. I believe we all do that at some point. Looking back on how 2018 happened for me was no different. However, for one reason or another, I have been unable to do a blog post since this year began. How fitting then, that my first blog post for 2019 should be a reflection on how my 2018 was as I look forward to more beautiful memories this 2019. In this instance, I will repost my Facebook post of 31st December, 2018. Do dig in and enjoy. It will soon be time again for that one second switch, with all our woes, joys, wahalas, uncertainties and all that into another year. As we all contemplate what 2018 has been and look forward to what 2019 will be, I have been doing some reflections. How deep they are, I don’t know but, it was like rewinding the hands of time and taking an inventory of what 2018 was like. It was a period of resolutions which ended in the first week for many, but which I have never truly sat down to do. I have learnt to just go with the flow and take each day as it comes. As I looked back, I realized that a lot happened. A whole lot did happen. Still, I didn’t in my wildest dream, imagined the way the year ended for some of us… get a harsh and painful dose of the reality and fragility of human life… losing #DtorSea, a sister like no other who gave all she had to impact and improve on humanity. Yes, it was a harsh wake up call, bringing the year ending to some kind of bitter sweetness. I would say so far, 2018 was a most impactful year, with equal doses of laughter and pain. 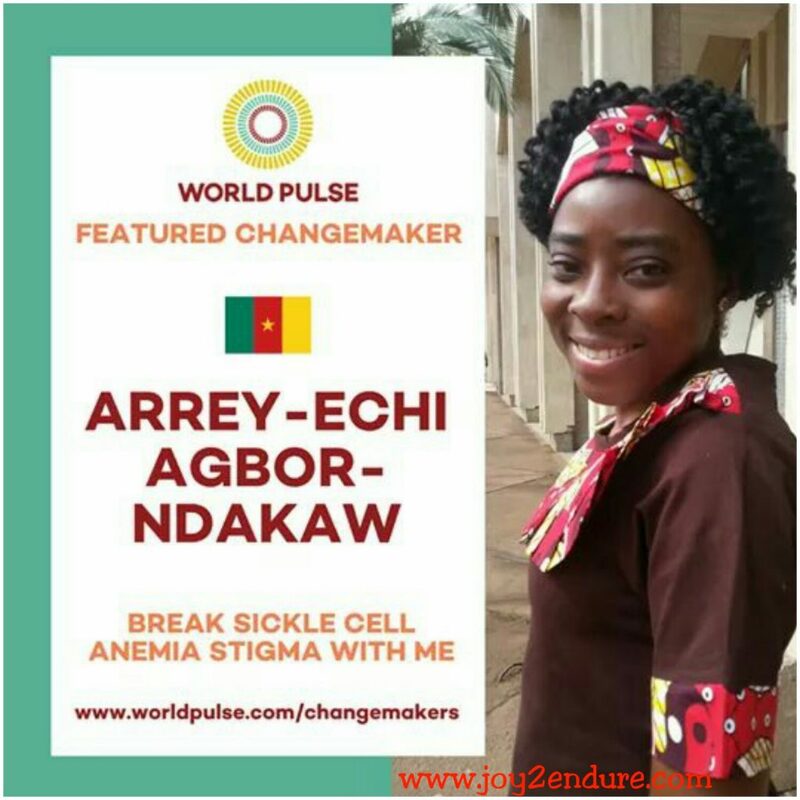 From being recognized by #WorldPulse as a Change Maker to being nominated for several awards to winning an award to being featured on BBC which helped to shake some tables, breaking the silence and making people talk Sickle Cell for a change, to being featured across several platforms, it has indeed been an impactful year. And just when I was about going down on bended knees for a great and impactful year especially as it came along with very minimal crisis episodes, the shocker came which completely changed the plan bringing in some really harrowing few days. 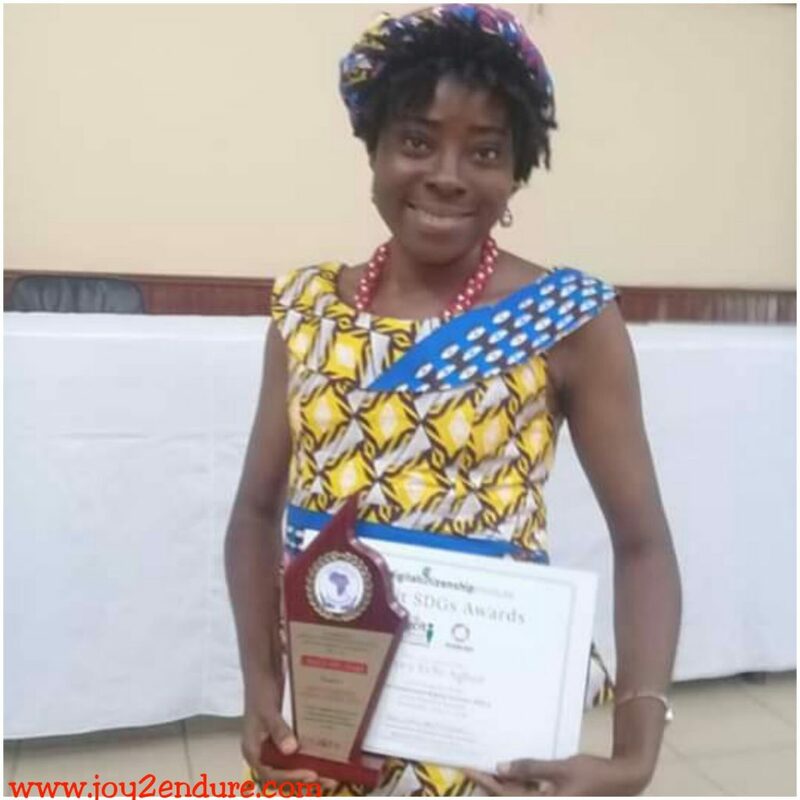 Dtor Sea adding her voice to the Break The Silence…Be A Sickle Cell Voice 2018 Campaign by summarising my posts for her audience. Her passing has been a real big blow and bitter pill to swallow. And of course, it was not all that rosy. The heart has been bleeding quietly even when I tried to laugh here, thinking of my people, my friends and the many innocents caught in the present crisis plaguing the country West of the Mungo. It has been a struggle keeping the smiles while going around with baited breath, fearing for the worst, especially with harrowing tales flooding this space daily. It has been one too many tenterhooks to walk on when those safely tucked away, add fuel by their rhetoric in these spaces, making things worse daily. Some plans were aced. Some not so, some at a standstill but still, I sailed through. In the midst of all these, the challenges and joys, the broken hearts and tears, I still look back with gratitude. Gratefully walking on stage to get my DIGCIT SDG 3 award in recognition for using Social Media and Technology to promote good health and wellbeing. * Grateful to my God Jehovah for the gift of life and relatively healthy and pain free year. ** Grateful to the many friends, especially the ones I met this year here who have added flavour to make this space beautiful and the year 2018 special. *** Grateful to the many who followed my activities behind the scenes, reached out in one way or another to enable me carry out most of my projects. **** Grateful to the many brothers and sisters who have gone out of their way time and again, to support and some even unknowingly, adding great positive impacts I learnt from. Excuse me if I cannot tag all the names here. Not only is tagging not my strong point here, but also the list is so long that it may take all night tagging. Thank you all for the love and encouragements. You all did more than you could ever know and I do not take that for granted. I Love and Appreciate you all. ● Grateful to all those who found what I do here worthy of an award and thus, nominated me for all these awards and features. 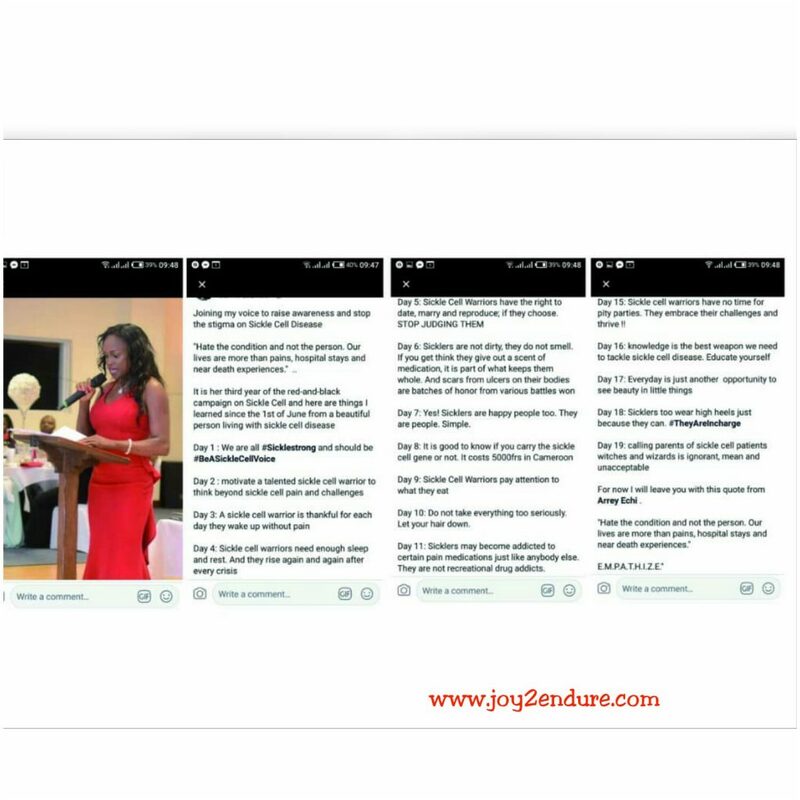 Just by finding what I do worthy, we all emerged winners. Thank you all. 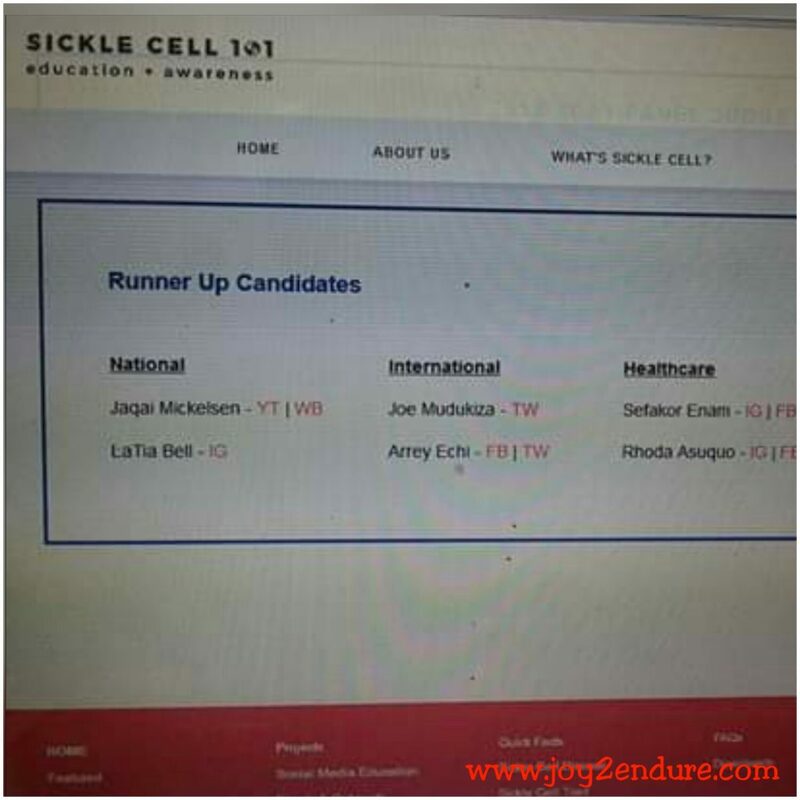 ●● Grateful to all those who featured me on their respective platforms, adding their voices to the break the silence and be a sickle cell voice movement . ■ Grateful to those who found my work inspiring enough and went out of their ways to let me know just how inspiring they did find it. ■■ Grateful to the difficult people too. They made me take a bit off my rose tinted colour glasses with which I see the world, while at the same time, helping me to be more empathetic. ■■■ Grateful to all the change makers and impact creators giving off themselves, determined to change their own small corners. ♤ Grateful to everyone who took their time to read the petitions and sometimes gibberish I write here, often leaving encouraging comments to the flow. ♤♤ Grateful to those who fall in a category I may not have mentioned above. You also helped to make 2018 beautiful especially in these spaces. ♡♡ Grateful for family and those special friends who have and continue to be amongst my biggest and most loyal cheerleaders. As we prepare to roll the carpet off 2018 and ring in the new with 2019 with a bittersweet heart, I know there will be challenges. There will be tears. There will be disappointments and above all, there will be joy and reasons to keep enduring. Here is to hoping 2019 will be even more impactful, giving us all more reasons to be thankful and grateful as we count our blessings. And thus, this was how I ended my reflective mode. A lot has happened this first quarter of 2019, how ever, that will be story for another day. In the meantime, I pray this breaks the blogging hiatus. See you all again more often, I hope in these spaces. Keep watching this space. Let Us know what you think. Thank you for stopping by. Prev FUN DAY OUT WITH WARRIORS: WHY IT WAS IMPORTANT.